I recently went to an Indian festival where they served turkey meatballs – they were delicious. I don’t usually care for the taste of turkey but I asked how they were made because I knew our patients would enjoy the unique flavors. Turkey does not have a lot of flavor but with some experimentation and a lot of spice, I was able to create my version of this tasty dish served over a tangy slaw instead of the typical sugary sauce used. You can also make this dish into mini sliders or serve as an appetizer with toothpicks. For the slaw: In a small bowl, mix the olive oil, vinegar, garlic, salt and pepper together. 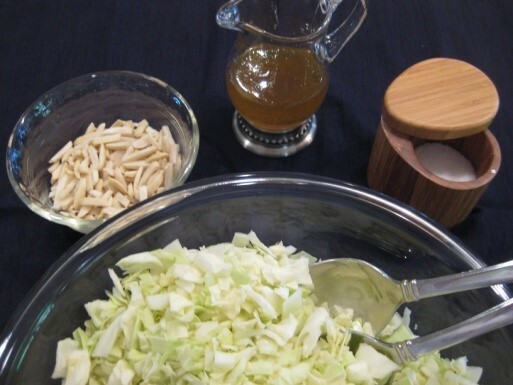 Pour over the chopped cabbage; add the onions, almonds, and sesame seeds. Mix well. Keep in fridge until ready to use. For the meatballs: In a food processor, add the onions, garlic cloves, eggs, cayenne pepper, salt, and ginger. Blend until onion is minced. Add the turkey meat, a third at a time; blend thoroughly. In a small saute pan, add the 4 T. of garam masala spice and toast for about one minute over high heat to bring out the flavor. Do not burn. Add to the turkey and mix thoroughly. 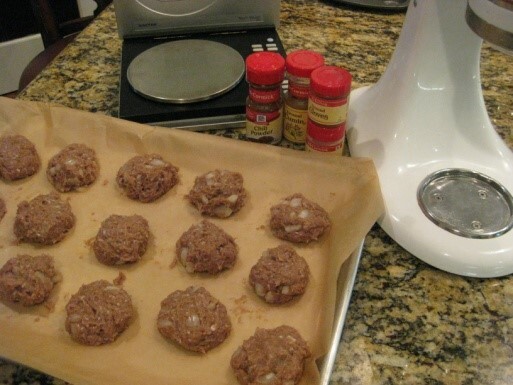 Form the meat into 1 ounce balls – I measure to get an appropriate size for the first one – and place on a vegetable oil-coated, non-stick baking sheet. If the meat is difficult to form, keep your hands wet with water while forming. Cook in oven for about 3-4 minutes at 400 degrees. Using tongs, turn the meatball and reform a bit if needed. Cook for another 3-4 minutes; should be completely cooked. Remove from oven. To Serve: For a group, place the slaw on a large platter and evenly spread the meatballs around the platter and put a large spoon on the plate for serving. 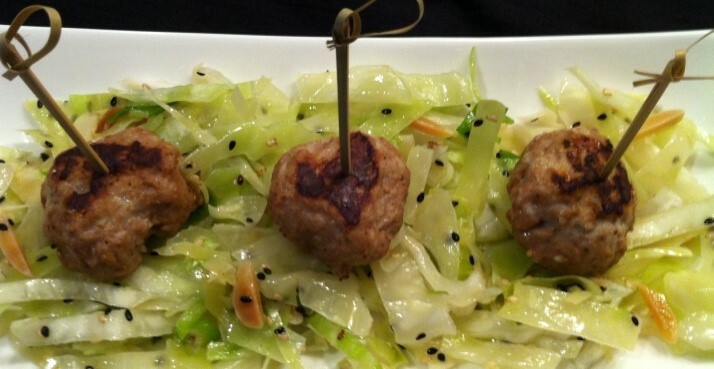 You can also place toothpicks in each meatball for easy pick-up or make individual plates with 1 cup of slaw and 6 meatballs. Serve warm or cold. Options: Reduce the fat content and eliminate the slivered almonds in the slaw crunch – I wouldn’t though. Try ground chicken instead of turkey. Can’t find garam masala? Use the following combination: 2 T. coriander, 1 T. cumin, 1 tsp. ground cinnamon, 1 tsp. ground cloves, and 1 tsp. ground cardamom. Nutritional Analysis: One serving of 6 meatballs with one cup slaw crunch contains approximately 34 grams of protein, 13 grams of net carbohydrate, 22 grams of fat, 3/5 grams of fiber and 370 calories. Just the meatballs: one serving of 6 contains approximately 32 grams of protein, 7 net grams of carbohydrates, 12 grams fat, 1 gram of fiber, and 270 calories.